When hitting a fairway wood, you should have the ball slightly forward in your stance, lined up with the heel of your front foot. A fairway wood is one of the clubs that you use least often during a standard round, yet when you do use it you are normally hoping to end up with an eagle putt on a par-5. To get the desired results from a fairway wood you need to use the proper swing technique. Some of the differences between a fairway wood swing and a middle or short iron are subtle. Using a fairway wood properly requires a little more concentration and finesse than an iron, because you want to make solid contact with the ball on the fairway and avoid taking a large divot. To practice swinging your fairway woods, lay the club that is not your fairway wood on the ground to establish the direction in which you will swing your club. Line your feet up with the club to be in a straight line pointing at the target, and spread your feet shoulder-width apart. 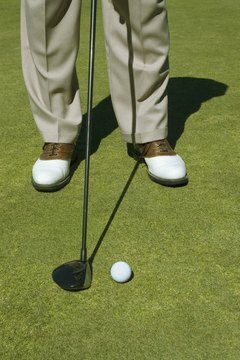 Place the practice ball on the ground where it should be in your stance and line up your feet with the ball. When you hit a fairway wood the ball should be forward in your stance, lined up with the heel of your front foot. Extend your arms and keep your back straight, and then flex your knees to address the ball with your club. Many golfers choose to tap behind the ball in order to get a feel for the point of contact. This is fine as long as you do not make contact with the ball. If you are hitting the fairway wood out of a sand trap, remember that you cannot ground your club in the trap before hitting the ball. The point of tapping behind the ball, especially in the rough, is to try and tap down the grass that would come between the club head and the ball on contact. You may actually want to take this moment to practice tapping behind the ball to create as clean a path as possible for the club. With your arms extended, keep your left arm straight and bring your club back on its back swing. If you are lefthanded, follow these steps but reverse the hands. At the top of your back swing the club should be parallel to the ground, your head should be down, your eyes locked on the ball and your hips turned back with the club. There are two temptations when it comes to swinging a fairway wood. The first is to look up and see where the ball goes immediately upon contact. Your head should be following the natural motion of your hips and arms through the swing. If you make sure to execute your swing properly, you should have no problem seeing the ball in flight after your head has come up with your swing. Take the time to practice keeping your head down and making your head follows the flow of your arms through the swing. The second temptation with a fairway wood is to swing the club much harder than you need to. First of all, you should choose a landing spot for your shot that is within the range of your fairway woods. You also need to employ the swing tempo with your fairway wood just as you did from the tee. Maintain a consistent tempo throughout your round and you will find more success with your fairway woods. Practice an even tempo and learn to resist the urge to swing your fairway woods harder than your driver.